Catholic Fun Facts - Page 4 of 14 - Learning the Catholic Faith can be FUN! St. Luke’s Gospel tells us that Gabriel told Zechariah, the priest, that his wife would have a son and he was to name him John. He announced to the Blessed Virgin Mary that she was to bear the Christ Child, our Savior. Gabriel appears to the prophet Daniel, according to the Old Testament Book of Daniel, to explain one of his visions. 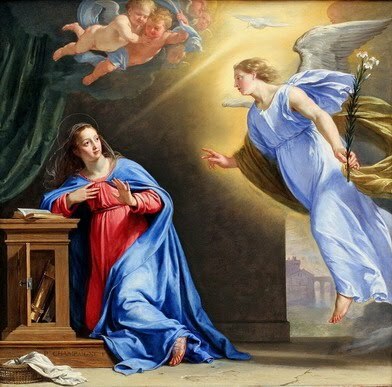 It was Gabriel, according to tradition, who told St. Joseph that Mary was pregnant by the power of the Holy Spirit. It was he who gave the news to the shepherds of the birth of Christ and who warned Joseph about taking Mary and Jesus to Egypt for safety. Athirst is my soul for the living God. During the time of Jesus, what was one of the signs that the kingdom of God was at hand? St. Turibius was born in 1538 at Majorca, Spain. He was a Professor of Law at the University of Salamanca and was appointed president of the court of the Inquisition at Granada. In 1581 he was named Archbishop of Peru despite his objections. He was still a layman. He was ordained and consecrated and sent to Lima, Peru. It was a difficult charge both religiously and geographically. During the next 25 years, he worked diligently for his flock covering the entire diocese entirely on foot through the steaming heat and tropical maladies. He worked to reform the clergy and instruct people in the Faith. He defended the Indians’ rights to the secular authorities who mistreated them. He founded the first seminary on the American continent, baptizing and confirming close to a million people. He learned the languages of the people. Among other ministrations he befriended and confirmed St. Rose of Lima. He died at the age of 68 in 1606. He was canonized March 23, 1726. What sins must be confessed in the sacrament of reconciliation? St. Nicholas of Flue was born in Switzerland on March 21, 1417. When he was thirty years old, he married Dorothy Wiss, a farmer’s daughter. They had ten children. He fought in the war with Zurich in 1439. He was a captain in the occupation of the Turgau in 1453. He served as a magistrate and as a counselor for Obwalden but refused to be governor. All this time he led a life of contemplative prayer and rigorous fasting. He received God’s call to leave the world and his family after 20 years of married life. With the consent of his wife, he settled in a hermitage nearby where he lived for 19 years. He ate no food or drink. He lived solely on the Eucharist. This holy man had a tremendous influence on the people. He settled many disputes, some which kept the country from warfare. He was affectionately known as “Bruder Klaus”. 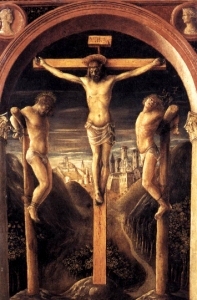 He died March 21, 1487 surrounded by his wife and children. What should one do to prepare to make a good confession? Born around 480 in Nursia, Italy, Benedict was educated in Rome. Because of the vices of the city, he fled to Enfide. He decided to live the life of a hermit and settled in a cave in mountainous Subiaco for three years. The community at Vicovaro asked him to be their Abbot. Because of his strictness, the monks resisted his rule and tried to poison him. He returned to Subiaco where he attracted a great number of disciples. His Rule offered a common-sense approach to the monastic life: He organized twelve monasteries where there was a regular routine of work, study, rest, healthy food and drink etc, which produced a closer union with God and a deeper understanding of His will. One of his rules was no excessive penances. 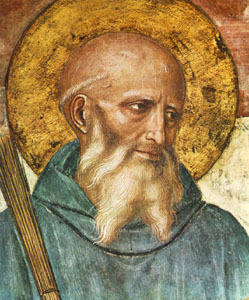 Benedict has been acclaimed as “the Father of Monks.” He died at Monte Casino on March 21, 550. A priest or bishop must preside in order for a community to celebrate Mass. True or False? Wulfran was in the court of King Clotaire III for some years. In spite of the seductions of the world, Wulfran practiced virtue. His father was an officer in the court of King Dagobert. Wulfran was ordained and consecrated Archbishop of Sens. After two and a half years, he resigned his position because of the possibility that his Bishopric was not valid. St. Amatus, its rightful Bishop, was in exile. After a retreat in the Abbey of Fontelelle, he went to Friesland as a missionary. There he converted a son of King Radbod and many others. He fought against human sacrifices. He returned to Fontelelle and died there March 20. The saints in heaven can intercede for us to God. True or False? Joseph was a royal descendant of the royal House of David. A lowly village carpenter of Nazareth, he was chosen by God to be the husband and protector of the Virgin Mother of Jesus Christ, God Incarnate. His family came from Bethlehem in Judea but he had moved to Nazareth in Galilee where he was a builder. After the Mother of God, no other man was gifted with natural and supernatural virtues as was St. Joseph, her spouse. He was the divinely appointed head of the Holy Family. On December 8, 1870, Pope Pius IX, solemnly proclaimed the foster father of Jesus as Patron of the Universal Church. This feast is celebrated on March 19. There is another feast of St. Joseph the Worker which is celebrated May 1. Blessed Pope John XXIII inserted the name of St. Joseph in Eucharistic Prayer 1, or the Roman Canon. The son of David will live for ever. Who was the disciple who betrayed Jesus? St. Cyril was born around the year 315 near Jerusalem. He had a great knowledge of the pagan philosophers and the Fathers of the Church, as well as Sacred Scriptures. Maximus, Bishop of Jerusalem, ordained him around the year 345. He succeeded Maximus in the See of Jerusalem about the year 350. This was a time when the church was distracted by Arian heresy. Acacius, the Arian Bishop of Caesarea, and Cyril had a difference of opinion about Arianism. Acacius claimed jurisdiction over the Church of Jerusalem, which Cyril disputed. He was forced to seek refuge at Tarsus for a time. When Constantius died and Julian succeeded him, Cyril was restored to his See. Several times Cyril was expelled and recalled on different charges; one was over the word “homoousios” the basic term in the Nicene Creed. The General Council of Constantinople adopted the Nicene Creed in 381. He was a scriptural scholar and a successful preacher. He was declared a Doctor of the Church in 1882 by Pope Leo XIII. What is the city where Jesus died on the cross? St. Patrick was born around the year 389 but the place and year of his birth are uncertain. When he was 16 years old he was captured and taken to Ireland where he was a herdsman. He retained his faith and learned the science of prayer and contemplation. He had a miraculous escape after six years and returned home. He was ordained to the priesthood. He dreamed that the Irish were calling out to him after his ordination “come back and walk among us again.” He believed that God wanted him to carry the faith to Ireland. Pope Celestine made him Bishop of Ireland where he made many converts to the faith. He died March 17, 461 leaving behind his “Confessions” which give a vivid picture of a great man of God. Jesus experienced joys and sorrows like everyone else. True or False?